In just a few months, Fuenlabrada have competed for promotion to the Segunda, signed a center-back from a La Liga side, and will now be playing Real Madrid in the Copa del Rey. This is part 2 of a series about Fuenlabrada, the mighty challengers to Real Madrid, who they play in the cup on the 26th of October. He was short. Very short. At 5'3", the left winger sometimes played in an over-sized shirt. The ball never left his feet. His feet were tiny but they had magic. A dizzying array of body feints, close control, direction changes and sheer speed, often resembling a roller-coaster, left opposition defenders outwitted. And yes - sometimes, he frustrated. Sometimes, he was irregular. But when he turned up, the world was at his feet. If Juan Quero plays against Real Madrid he'll be playing against the club that let him go. The club that didn't think he had it in him to become a La Liga player. The club that was wrong. Very, very wrong - he went from playing in the fourth tier to the first in just three years. He started started playing football at the age of five, but after being picked up and then released by Real Madrid, he graduated from Las Rozas. He would play his first two seasons as a senior, the 2003-04 and 2004-05 campaigns, at Tercera side Santa Ana. Segunda B side Alcorcón signed him, and impressed in the 2005-06 season at the age of just 21, scoring four goals. His rise to the top could have been quicker - in 2006 Poli Ejido in the Segunda signed him. However, the signing was appealed by Alcorcón, and the RFEF actually ruled in their favor - meaning that Juan Quero had been a Poli Ejido till October yet had never wore the Poli Ejido shirt. However, after another successful Segunda B season with Alcorcón, Segunda side Numancia successfully signed him. 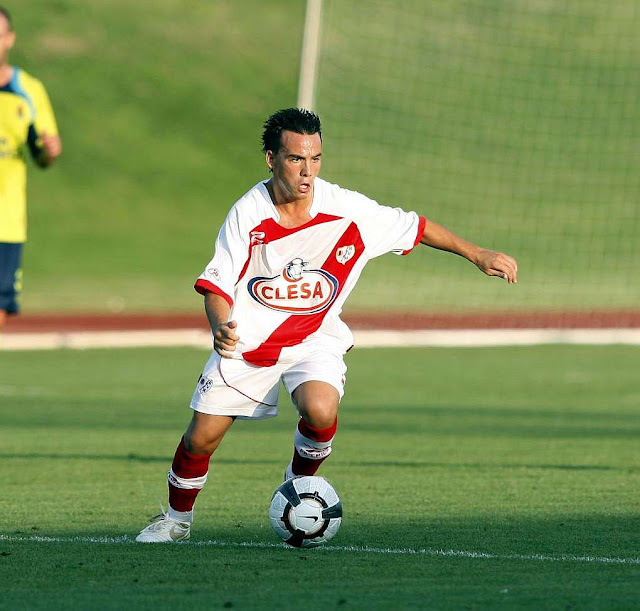 Numancia won the 2007-08 Segunda season, and so Juan Quero was in La Liga. And things came full circle - his debut in La Liga was at the Santiago Bernabéu, against Real Madrid, in a 4-3 loss. But life isn't a circle. It is a roller coaster - and Juan Quero certainly rode it. He was born in Vallecas. And he came back home - signing for Rayo Vallecano after his La Liga season was spent largely as a substitute. After impressing during Rayo's turbulent 2009-10 season, he was asked to leave on loan to Elche for the 2010-11, but José Bordalás deemed him surplus to requirements within months and he subsequently joined Las Palmas for the rest of the season. Paco Jémez was so impressed with him that he brought the diminutive winger to Córdoba with him for the 2011-12 season on loan, where he acted as a super-sub. Since then, Juan Quero has been released by Rayo in 2012, spent six months with the Sesiones AFE, signed for Dubai CSC in the United Arab Emirates in January 2013, moved to Buriram United in Thailand in March 2013, moved to Chonburi FC on loan in the same country in June 2013 (which ended in December), moved to Oriente Petrolero in Bolivia in January 2014, moved to Ratchaburi FC back in Thailand in July 2014, moved to Hércules back in Spain in January 2015, moved to Birkirkara FC in Malta in August 2015, moved to DSK Shivajians in India in February 2016, and moved to Fuenlabrada back in Spain once again this summer. May the roller-coaster player continue his roller-coaster career. Thanks for the comment! Juan Quero's case is still a mystery to me - in the sense that how many players like him who struggle through the Segunda B, never to be recognized or acknowledged, simple because they never moved to a foreign league? Hundreds of them, I presume. Also, I've emailed you - look forward to your response!